My 5-year old son loves all things dinosaurs, which means that we've been going on many adventures in search of the elusive dino tracks and bones. Luckily, we have many options - from digging in sand for dinosaur bones to seeing real-life replicas in a museum, to a park dedicated to the giant creatures, the Austin-area has many outings that will appeal to dinosaur lovers of all ages. Exhibits are the Texas Memorial Museum are based on the 5.7 million collected specimens from research conducted at the university. Exhibits focus on prehistoric life, evolution, rocks and minerals, and Texas wildlife. Admission fees apply. Read more about the Texas Memorial Museum here. Celebrate the end of the school year at the museum on June 3rd. Admission is free at this special annual event. Details here. There are two different options for Dino Discovery in Zilker Park: The Dino Pit at the Austin Nature and Science Center and the Hartman Prehistoric Garden inside Zilker Botanical Garden. The Dino Pit is an outdoor paleontology exhibit designed to instruct visitors about paleontology through hands-on educational experience. In addition to the giant sand pit where kids can dig for bones for hours, there are dinosaur trackways, a field collection display that highlights fossils found at the 301 Congress Avenue construction site several years ago, and an observation deck. Admission fees apply. Visit the life-size sculpture on Dino Island of an Ornithomimus, a dinosaur that left tracks in the garden area. These tracks, found in 1992, have since been reburied to prevent deterioration from exposure, but this 2-acre site within Zilker Botanical Garden has been developed into a Cretaceous habitat with a wide variety of plants originating from the Jurassic period. Admission fees apply. Bonus: A trip to Zilker Botanical Garden will get you two checks on your 2017 Summer Fun Checklist! Think your kids would like to see a T-Rex squirting water on your car? 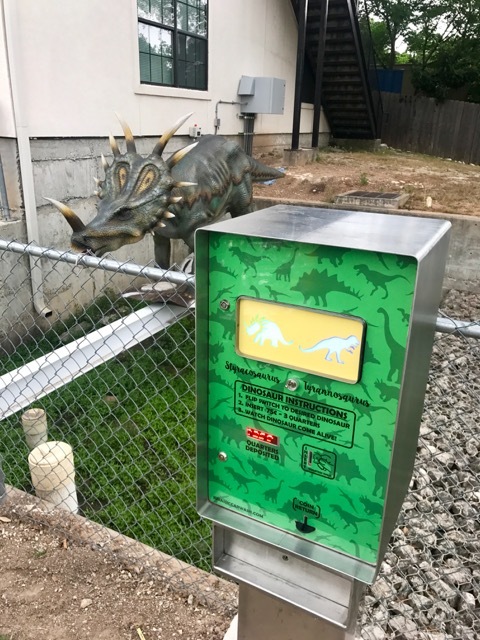 This Jurassic-themed car was in south Austin also has the first coin-operated mechanical, animatronic dinosaurs in Central Texas. The two museum and exhibition quality dinos are a Styracosaurus and a Tyrannosaurus Rex— each 12 feet long and 6 feet tall. For just 75 cents, the two dinos come alive with roars, movement and more for a full two minutes. The coin-activated dinosaurs operate seven days a week, 24 hours a day (the same as Jurassic Car Wash itself). Be sure to point out the Pterodactyl on the roof and a Dilophosaurus on the building,each one coming alive on the hour and half hour daily between 10 a.m. and 7 p.m. for free. Known for family fun, Peter Pan Mini Golf has been an Austin tradition since 1948. 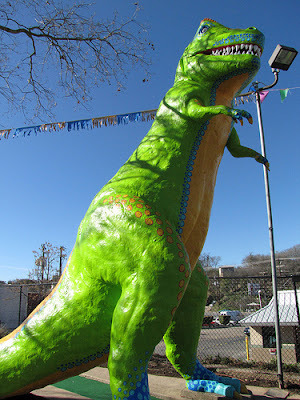 There are two 18-hole courses and the statues have recently been refurbished and repainted, including the giant T-Rex! Tip: Beat the crowd and the heat during the summer months and plan to go early. Cash and checks (for locals) are accepted with an ATM on-site. You can bring a cooler, but no glass. Admission fees apply. 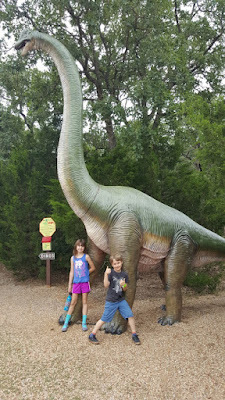 This park, located just north of Austin in Cedar Park, offers a large, covered sand pit with castings of dinosaur bones to discover. For those hot summer months, kids and adults will appreciate the large blue whale that spurts water to cool down. Pack a picnic and eat under the pavillion, fish, hike the trails, scale the large boulder, and explore nature after you are don digging for dino bones. Free admission. 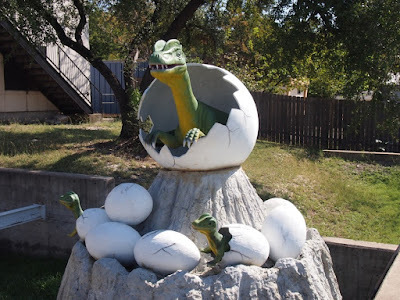 Located just before you reach Bastrop, this family-owned park was built out of the desire to appeal to dinosaur lovers of all ages. Set among many trees, plants and rocks, kids can marvel at the realistic life-sized dinosaur exhibits in an outdoor museum setting. Ranging in size from 2-feet long to up to 55-feet long, these dinosaurs show skin and color variations to give a better idea of how they looked in real life. Be sure to pick up a numbered checklist at the beginning of the trail. Kids will also enjoy the fossil dig, a playground and a picnic area. Admission fees apply.